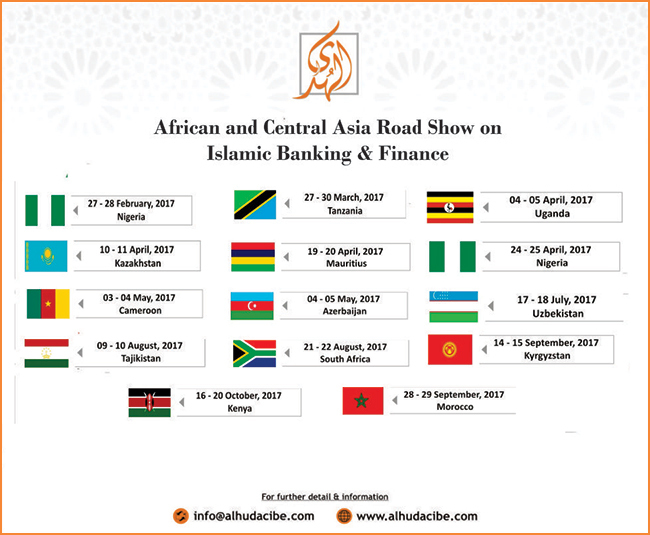 9th February, 2017 (Dubai): Al-Huda Centre of Islamic Banking and Economics (CIBE) is committed to hold an African & Central Asia Roadshow on Islamic Banking and Finance starting from Tanzania on March, 2017 with a mega event called 4th African Islamic Finance summit, followed by an African Takaful forum in Nigeria and specialized training program in Kazakhstan in April,2017. The series of these events will cover 8 African and 5 Central Asian countries i.e. Tanzania, Nigeria, Uganda, Mauritius, Cameroon, South Africa, Kenya and Morocco and on the other hand Kazakhstan, Tajikistan, Uzbekistan, Kyrgyzstan and Azerbaijan respectively. Road show is bound to get an end by organizing event on Islamic Agricole & Rural Finance in Kenya by October 2017. African & Central Asian regions can make rapid progress seeking benefits from international Islamic banking practices. Apart from Islamic banking and finance Takaful, Sukuk, Islamic Funds, Islamic Microfinance and various other relevant topics are to be discussed during the programs. Addressing to the announcing ceremony of the Road Show, Muhammad Zubair Mughal, Chief Executive Officer, Al-Huda CIBE expressed that due to sharp declined trends in Oil prices, slow economic pace & Arab spring, the trend of the Islamic Banking & Finance had been slow paced in 2016 in Middle East and Arab region, while a sufficient development had been recorded in Africa, Central Asia & Far East. To know the overview of Islamic Finance Industry, we can divide Islamic Finance industry into five major components e.g. 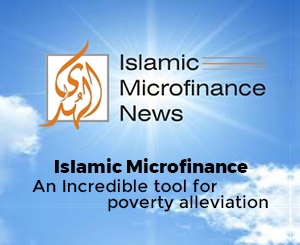 Islamic Banking, Sukuk, Islamic Fund/Asset Management, Takaful & Islamic Microfinance. Islamic Banking is the greatest contributor to Islamic Finance Industry, which contributes 80% to the total $ 2.3 trillion of Islamic finance industry, while Sukuk contributing 14% volume to Islamic Finance industry and ranked as second largest contributor, Islamic Fund/Asset management Industry with 3% is ranked as 3rd while Takaful Industry contributing 2% with slow pace and Islamic Microfinance contributing 1% stands as the last. By 2017, the total volume of Islamic Finance Industry is expected to be USD 2.7 trillion. While talking about African & Central Asian road show, he further indicates that how this roadshow can be beneficial and helpful in promotion of Islamic Finance in both regions. Many new Islamic Finance markets are seen to be emerging on the horizon in the world. If we see on the regional basis, in East Africa, we find that Uganda has recently passed an Islamic Financial bill through Parliament. Islamic banking & Finance in Kenya and Tanzania is already flourishing very well. Morocco & Tunisia are emerging markets in North Africa while Nigeria, Senegal, Mauritania, Ivory Cost in West Africa has an organized system of Islamic Finance while Sukuk is also strengthening its roots in these regions. As far as Central Asia is concerned, this year will prove to be a better year with respect to the previous year. The main reason is the increasing tendency of Russia towards Islamic Banking & Finance; the countries in central Asia are closer to Russia in Banking & Finance despite its having been separated from USSR. He further added saying that besides the promotion of Islamic Banking and Finance, the purpose of the road show is also to acknowledge the need of giving hype to the system beyond any political and religious refrains. Specialized training workshops on various relevant topics will also be part of this two nation’s roadshow like Takaful workshop in Kazakhstan, Islamic banking and finance workshop in Tajikistan, Islamic Microfinance in Nigeria, Islamic Agricole and Rural Finance in Kenya, Takaful workshop in Mauritius. The core objective of the entire program is to strengthen the foundations of Islamic banking and finance in African & Central Asian region further to give support to the progress of Islamic mode of banking and finance in the region. AlHuda Center of Islamic Banking and Economics (CIBE) is a well-recognized name in Islamic banking and finance industry for research, advisory and capacity building over the last twelve years. The prime goal has always been to remain stick to the commitments and provide state-of-the-art Advisory Consultancy and Education through various well-recognized modes viz. Islamic Financial Product Development, Shariah Advisory, Trainings Workshops, and Islamic Microfinance and Takaful Consultancies etc. side by side through our distinguished, generally acceptable and known Publications in Islamic Banking and Finance. We are dedicated to serving the community as a unique institution providing Services not only in UAE/Pakistan but all over the world. We have so far served in more than 35 Countries for the development of Islamic Banking and Finance industry.